The weekend saw more than eight inches of rain in some parts of the state. A weekend of rain, hail and high winds has left its mark on Oklahoma. 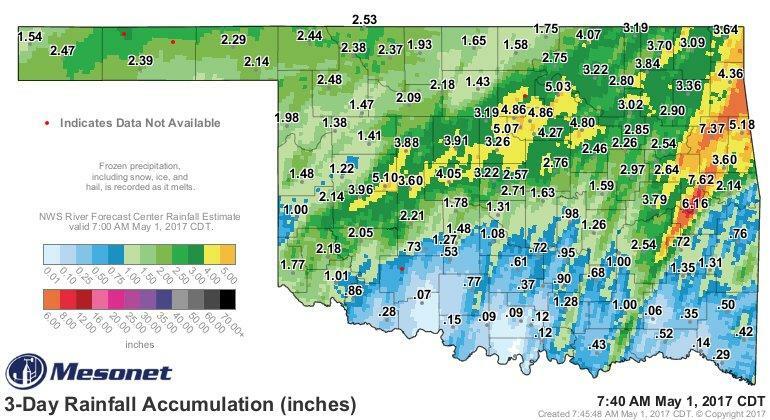 More than eight inches of rain flooded parts of northeast Oklahoma, shutting down roads and overflowing the Illinois River, which peaked at 29.35 feet near Tahlequah on Sunday morning. The flooding shut down roads and damaged buildings. According to the National Weather Service, winds reached up to 80 miles per hour in some parts of the state, damaging trees, property and infrastructure. Meanwhile, the panhandle saw wintry temperatures and over two feet of snow in some parts. At one point on Sunday, 12,000 Oklahoma Gas and Electric customers lost power. As of Monday at 4:23 p.m., 3,500 OG&E customers were still without power, almost 2,800 of them in Oklahoma City. The company announced that most would see service restored by the end of the day, but some might have to wait until Tuesday. 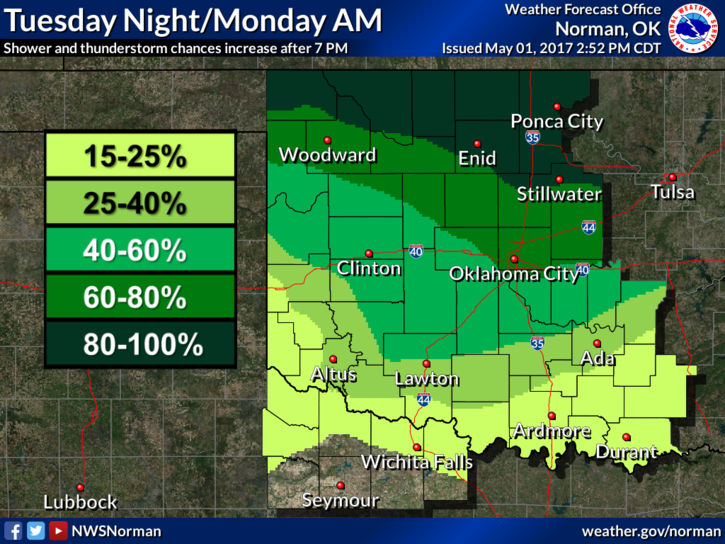 The National Weather Service forecasts more rain on Tuesday night after 7 p.m., with higher thunderstorm chances in the north of the state. The National Weather Service forecasts more storms for Tuesday.